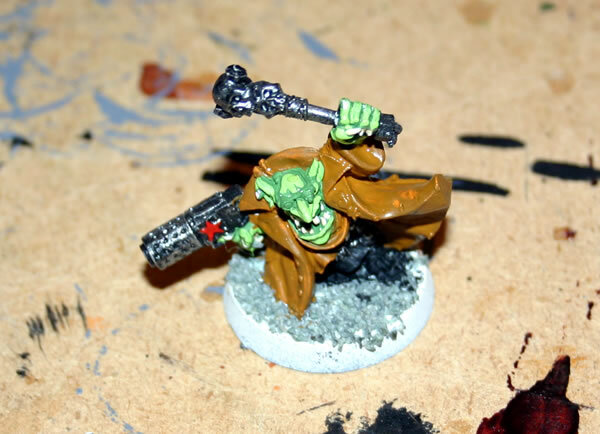 I do like the underdog and this page shows how I painted my Grot Rebel Leader for Warhammer 40K. The model was originally released for Gorkamorka. Here he is in his undercoated state, for Orks I use black, for Gretchin and Grots I use a white undercoat as it usually results in a lighter look for the Grots and a darker look for the Orks. The base is flocked with model railway ballast. First I paint the skin in Goblin Green and then all the equipment in black. I have also painted the underneath in black (as that will never be seen in games). The black parts were drybrushed with chainmail. The skin was then highlighted with Bilious Green. I painted his coat Snakebite Brown. The flash has emphasised how unhappy I am with the paint job on this model. I am certainly not happy with the flesh tones compared to other Grots I have painted. At this point I did seriously consider I might just abandon him and start over.